Google confirmed recently that it will no longer be showing paid advertisements in the far right column of its search results. This change appears to be the result of testing that has been going on since December (and can be traced back as far as 2010). Out with the old… …and in with the new. It’s still too early to draw any definitive conclusions about paid ad performance going forward, but there are a few things you should be doing now to make sure you’re well positioned for success in this brave new world. So What Exactly Has Changed About the Way PPC Ads Are Displaying? The “right rail” of ads is being removed; that space is now going to be used for Knowledge Panels and product listings, depending on the relevancy of the search query. Up to four text ads will now be shown above the organic and local search results, instead of the maximum three ads we’ve grown accustomed to. Google states that “highly commercial” queries are going to be more likely to trigger four ads than others. Three text ads will also be added to the bottom of the search results page. This means there will now be a maximum of seven paid ads on each results page. It seems relatively safe to assume that competition for the top three or four ad spots will increase, and average cost-per-click prices will increase as well. If you currently have ads running in Google’s AdWords platform, now is a great time to check in on your average ad position. Were you getting by with ads in the fourth or fifth position overall? These slots used to be located in some pretty good real estate at the top of the right sidebar (and also typically benefitted from lower cost per click than the top three ad positions). But now—unless your target query is deemed “highly commercial”—your fourth- and fifth-position ads have been relegated to the bottom of the SERP. There may be a silver lining here though: It is possible that adding a fourth top spot could actually lower prices by increasing supply. Another possible consequence may be lower prices and less competition for the ads at the bottom of the page. Keep a close eye on your ad performance over the coming weeks, and consider adjusting your bid strategy based on what you see. What’s Up with This “Highly Commercial” Caveat for Displaying Four Ads? 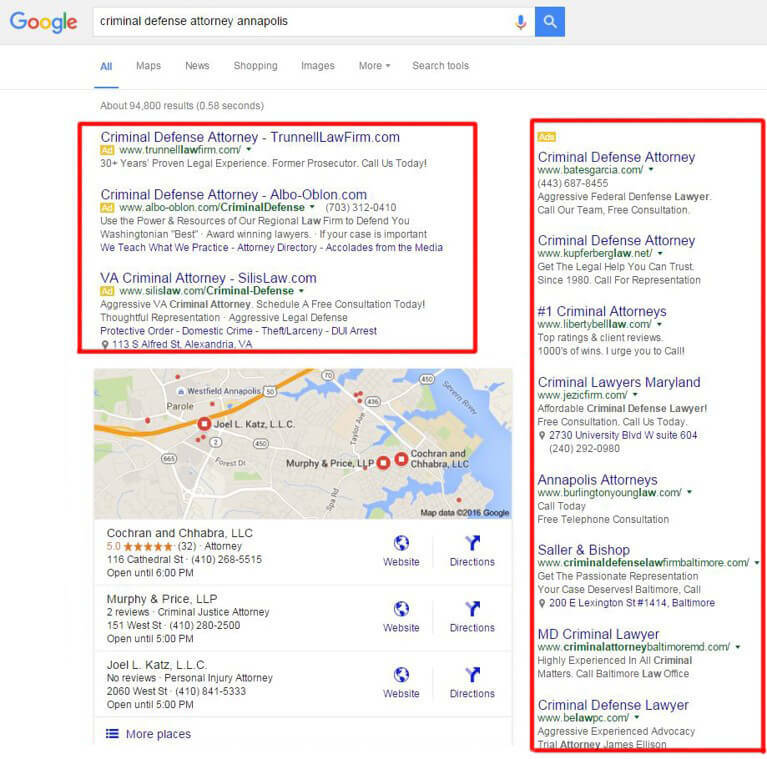 No one knows yet whether Google considers legal searches to be “highly commercial” queries. Some queries betray a more commercial-oriented intent than others: someone searching for “medical malpractice attorneys in Washington, DC” may appear to Google to be more commercially-focused than someone searching for a longer, more specific search like “what is the statute of limitations for medical malpractice claims in Washington, DC.” Time will tell us for certain, but we can expect at least some legal search queries to trigger all four paid ads at the top of search results. Does This Mean that Organic Search Isn’t as Important Anymore? No! In fact, you may find yourself relying on your organic traffic even more if the competition for top PPC positioning increases dramatically. Remember that in most instances, the keywords and phrases you’re targeting with a paid campaign and with organic optimization are going to be very different. PPC is a great place to go after those highly competitive (and in Google’s eyes, perhaps “highly commercial” as well) “vanity” keywords such as “personal injury attorneys in Fairfax.” The content on your site—the stuff that ranks organically—is often best suited to long-tailed phrases more similar to the statute of limitations example used above. Organic search isn’t going anywhere, and these new changes shouldn’t affect the organic traffic your site receives. Yes, it’s true that this change shoves the organic results even further down the SERP, but this is simply the latest in a well-established trend of several disparate Google entities jockeying for the above-the-fold space in search results. Remember when the local pack showed seven results instead of three? Organic traffic remained unaffected. The bottom line is this: not every search will show four ads. Not every search shows paid ads at all. Continue to focus on your organic presence in addition to your paid advertising. Until we’ve had a chance to collect and analyze several weeks (or months) of data, I’m going to defer any suggestions to make sweeping changes to your PPC tactics. In the meantime, make sure you’re paying close attention to your ads’ performance. Pay particular attention to your average ad positions—especially those in the four-to-six range—and average cost per click. And as always, give us call at 888-886-0939 if you have questions or need help!